Works a treat, makes me somewhat jealous! Nine seconds of excellence John! Envious of the space you have there. My only comment is that there looks to be a bit of vertical movement most noticeable in the last 2 seconds, presumably at the transition of the gradient. I'd make sure that's as smooth as possible to minimise risk of uncoupling, things like Dapol IKAs (which I imagine you may well have) are very prone to it. Give the man a prize!!! Yay, small world John! Lived in Daisy Hill from '69 (ish) to '79. Attended Westhoughton Comp' High. Just noticed your layout thread. Will have a good read through it asap. From a quick skip througjh for now, your layout is progressing really well. I disagree, I think that's a lot of vertical movement, especially as there is no gradient there (at least not any intentional one)!!!! It shall be sorted as I have yet to reinstate super elevation on the curve north of the station and I have yet to fully wire and fettle all the tracks in the station itself. Isn't it great how well a video can show up flaws in our track laying that can go unnoticed when looked at from above? I don't doubt it's magnified in the video, but would be a real shame to find you can't get reliable running, so you're right to try and resolve it. Gradient must just be parallax error or my dodgy eyes! 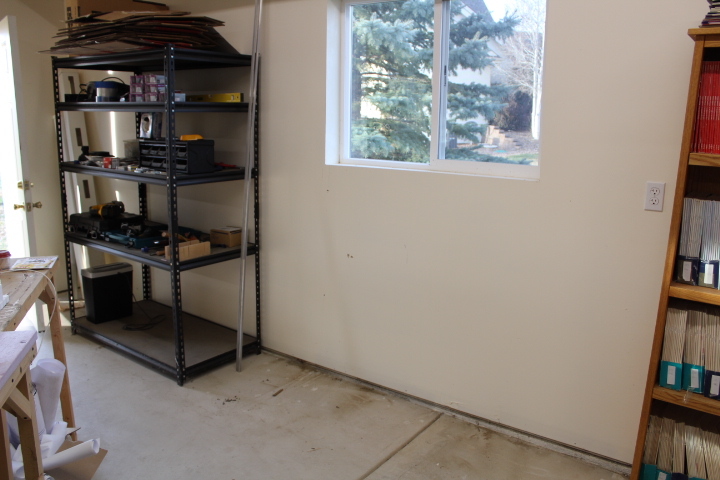 Well progress has been slow over the past couple of weeks as everything I have touched has turned to dust. 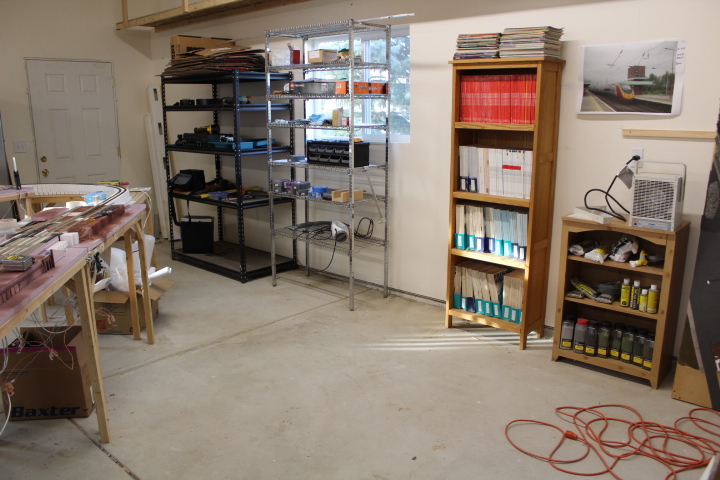 I decided to take a break from track laying to get more stock out of storage and to try to fix some non-runners. Tonight I put a Zimo Next18 decoder in a second CL68, the cab lights came on immediately and I cannot get them to turn off. They will turn off, cos when I program a CV they flash, and when I reset the loco they stayed off the whole time that the programming light was lit on my Z21, BUT as soon as I went back to 'normal' mode the d**n lights came back on. (Might have to create a post about this as well). I might be able to use this decoder in my Pacer as I don't think that all the function outputs are used. I can't send anything back as most of this stuff has been sitting around for over a year while I got the layout off the ground. Anyway, I'll probably revert to some more track laying this week and try to post a couple more videos. To cap it all, I ordered 4 more Zimo Next 18 decoders only to find out after my money had been taken that they are on back order! Oh, and we had a burst pipe in the basement last week and will have to replace all of the flooring, and we broke our washing machine as well, but that got fixed yesterday. I found a couple of Digitrax decoders lying around plus a Zimo MX621N in my electronics box of bits. So I decided to chip a second Dapol CL156, the S&C special edition. I ran in on my DC test track first and it was really bad, I then had the brainwave of cleaning the wheels, out came the IPA and a cotton bud and after a few seconds work the driving car was buzzing round the track quite happily, I did the same with the trailing car and let both run around in both directions for 20 minutes or so. Next I put the Zimo in the driving car and the Digitrax in the trailer, popped both on the programming track and set the DCC address. Put it on my layout and it runs really well, so I know have two of these up and running, plus a dummy set. I also tried to use DCC commands to tell my DCC Specialties PSX-1 to turn track power on and off. This was less successful. The instructions say that you can turn track power on and off by writing to address 2042, but they don't give any hint as to what should be written to this address. Anyhow I tried it and it sent the rest of my accessory decoders haywire, AND IT CAUSED A SHORT! After disconnecting substantial parts of the layout I finally tracked the short down to a point where the tortoise motor had moved but the actuating wire had sprung out of the tie bar so the frog switch had changed polarity but the point blades hadn't. The point had moved due to the accessory decoders being affected by the PSX-1 DCC command. Next up will be reconnecting everything, but at least it means I can tidy up the wiring at the same time. I have to keep telling myself that. The only good news in this is that I am using Wago Levernuts to connect all my droppers and frog wires, so disconnecting and reconnecting them doesn't need any soldering or any other tools. You never know I might even have trains running again before the weekend. But it doesn't cover programming, which is in the instructions. I can't remember the details, but essentially, you assign it a DCC accessory address, and then you can turn it off and on as if you are operating a point. When I was using NCE kit, addresses above 2000 were ok, but since swapping to Uhlenbrock, I had to use lower addresses, because those over 2000 are used for route definitions. Just something to consider. The address information about routes may be the issue. I am using a Z21 which supports route setting. I’ll try programming a lower address and see what happens. I’ve always found programming the PSX a bit of a messy affair! Well a lot of work has ensued since tracking down the short circuit on the layout, unfortunately as it was all wiring there's not a lot to see. I have successfully hooked up all the trackwork in Wigan Northwestern and got all the points working, I've also lifted and relaid some track that either had terrible soldering or wasn't flat. 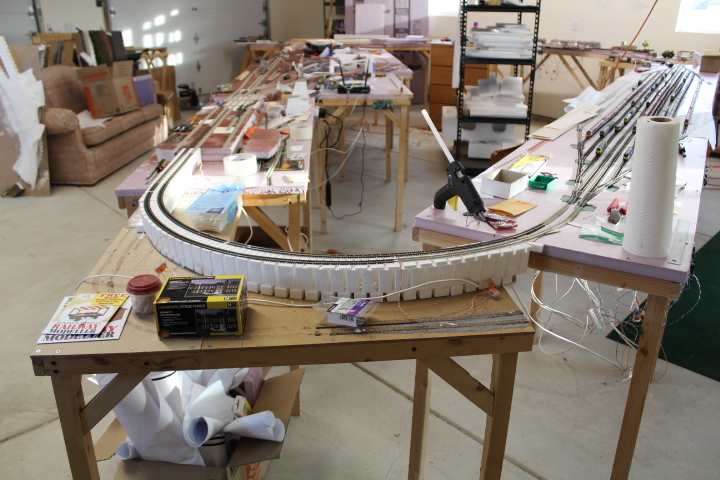 I've shocked myself seeing how many mistakes I've made with wiring and track laying when I was working to a deadline before Christmas 2 years ago. Anyway all that's left to wire up, and fix, is the trackwork for Wallgate and it's junction with the mainline. I have made another, rather blurry, video. It's my CargoWaggon Twins with some Dapol Cargowaggons interspersed to make a long rake. No whistling this time, but a lot of noise from the fan heaters in the shed. Now a number of the Twins have had their brake gear removed as it was fouling the wheels and I have yet to reattach them, can anyone see which wagons don't have brakes? I've spent some time this week clearing space in the workshop and planning out what to do at the southern throat of Wigan NW and beyond. I've decided to go a little crazy and to try to model the railway as far as Golborne junction but in a very compressed form. 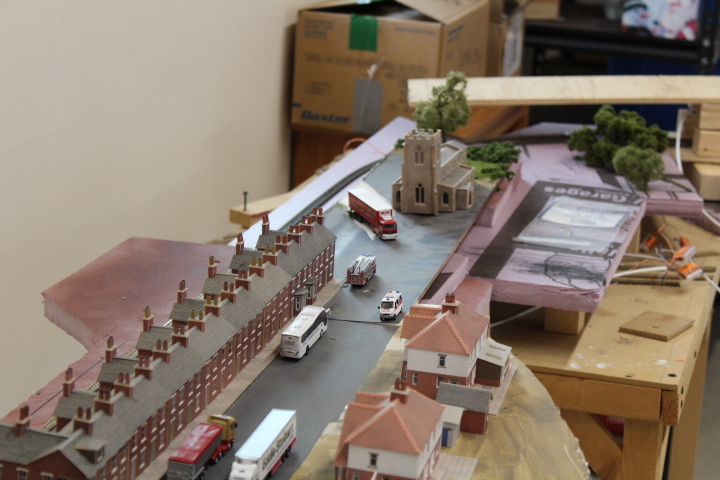 So most of the junctions will be modelled but they will be rather close together. I'n ignoring the triangle around Ince Moss Junction and the lines to Liverpool, but I have left room for something at Springs Branch and also for the Hanson Aggregate traffic to Haydock and the Manchester line at Golborne itself. 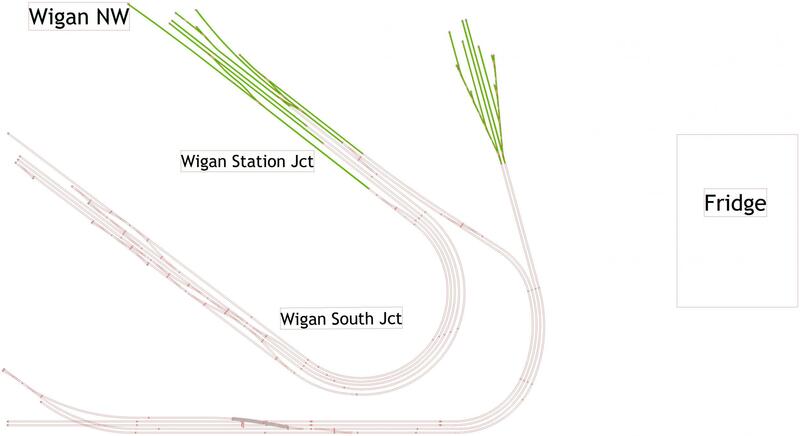 In addition the Atherton(Westhoughton) line will curve around clockwise adjacent to the line from the main storage yards, it will then drop under the mainline and join up with the Kirkby line to the West of Wallgate station. The plan is now so big that I can't upload all of it, so here is the first bit, track in green is already laid. I have had to move some stuff around and had a bit of a clear out to get more space for the curves. 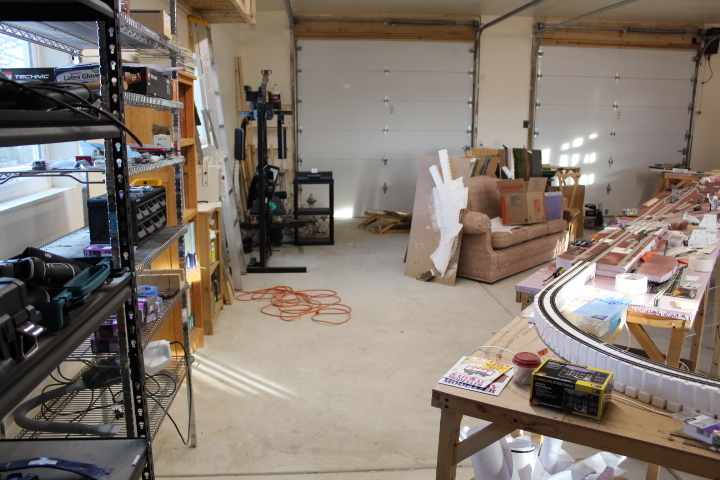 But to do this I will have to remove the temporary tracks that currently allow me to have a continuous run by connecting the storage yard to the main line. 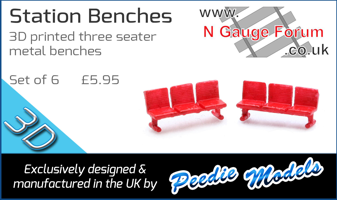 I've also had a play with reusing some scenic bits from my old layout to see how they would fit on this one. This row of terraced houses will sit a little higher than the track to hide the crossovers before the entrance to the storage yard, it will also get more houses added, and the track will sit in a cutting.